After my visit to the National Museum of Denmark, I made a 10-minute walk to the Christiansborg Palace. When I was at the palace ground, the whole place looked secluded. There were no tourists walking around. I know there were people at the palace as there were quite a few cars parking nearby. It took me a while and found the gift shop which was also the ticketing booth. Once again, armed with my Copenhagen card, I need not pay for the entrance fee. As I was early for the tour, I decided to take a quick look at The Ruins. 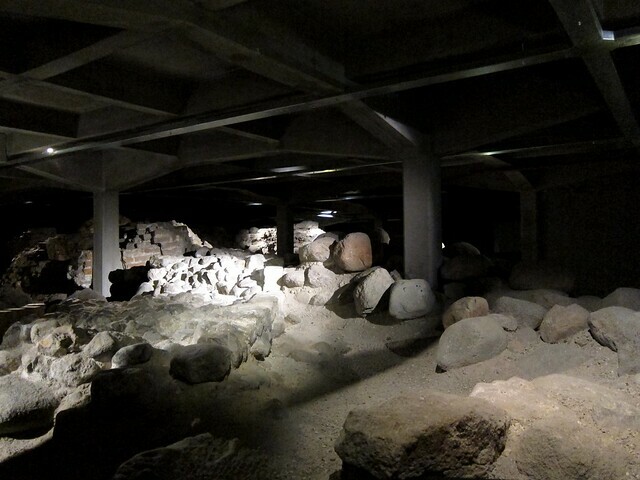 The Ruins is located underneath the Christiansborg Palace and it comprises of the ruins from the Absalon’s Castle and the Copenhagen Castle (which were the first and second castle that were built before Christianborg Palace). The truth is it is rather difficult to be excited by a pile of rocks. Unless you are an avid fan of archaeology and Danish history, chances are you’ll be like me going “it is a lot of rocks here”. At the end of The Ruins exhibit, there is a video which illustrates the history of Christiansborg Palace. The poor Christiansborg Palace was burnt down twice! This makes a total of five castles being built on the same ground. I walked back to the gift shop and enquired about the meeting point for the tour (which was right in front of the shop). There were lockers beside the gift shop, and I decided to park my heavy coat there. Before I embark on the tour, it is mandatory to wear shoes gloves. Yes it is not a pretty sight but hey I ain’t doing this alone. Minutes after wearing my (blue) shoes gloves, my guide, Brigitte arrived. 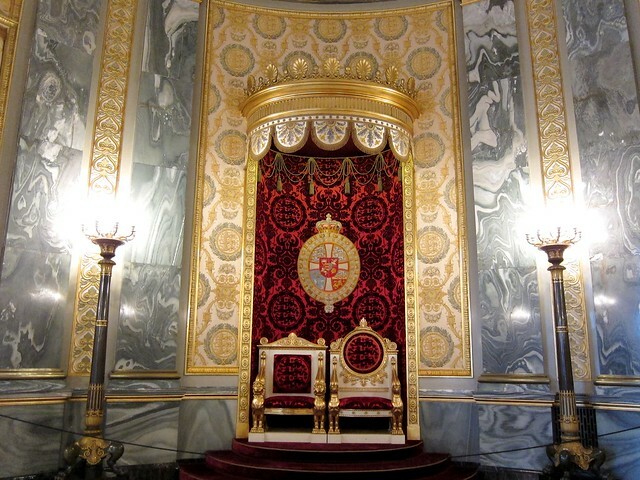 The English speaking tour covers the Royal Reception Rooms and the Great Hall with the Queen’s tapestries. Brigitte first gave the group a brief history of the palace. 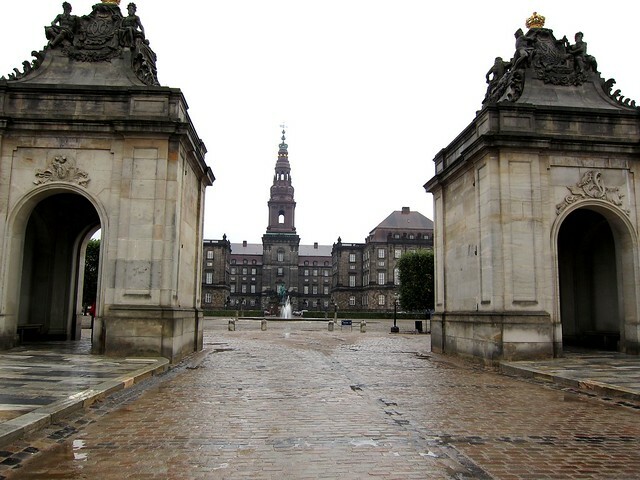 The current (and third) Christiansborg Palace was built to be the permanent residence for the Royal Family. After the second fire, the Royal Family moved to the Amalienborg Palace and since then the reigning king decided to stay there and not move into the Christiansborg Palace. Today the palace houses the Danish parliament and the Supreme Court. 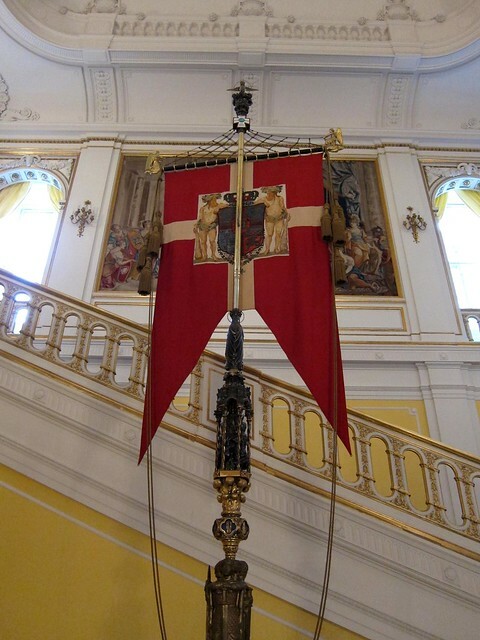 Our group went on the King’s Stairway which gives us access to the Royal Reception Rooms. Each room has its own purpose and it is decorated with beautiful artwork both on the wall and ceilings. 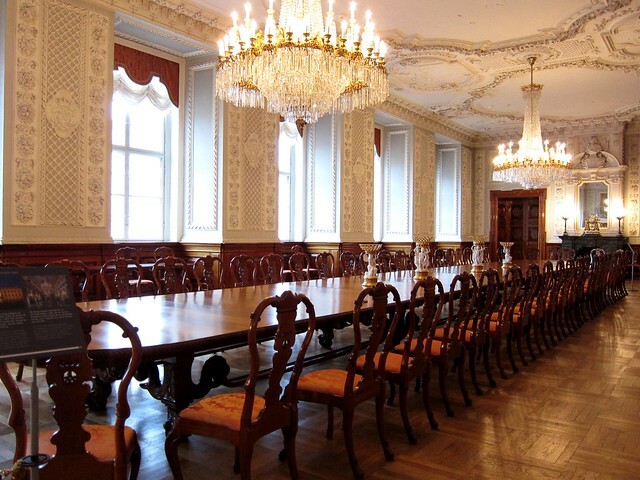 One of my favourite rooms is the Alexander Room (Alexandersalen) where royal banquets are held. In the middle of the room sits a long table that can accommodate up to 50 guests. Brigitte went on to tell us that when there is a dinner, the staff will prepare the food in the nearby smaller rooms. All the food is prepped and cooked before reaching the palace as there is no cooking facility. Guess there won’t be any piping hot soup. We continued our tour and made our way to the Great Hall where the Queen’s tapestries reside. The Great Hall is the largest of the Royal Reception Rooms. To celebrate Queen Margrethe’s 50th birthday, artist Bjørn Nørgaard created 17 tapestries which illustrate the history of Denmark. These tapestries are hung on the walls of the Great Hall. There are quite a few hidden messages in the tapestries and on the walls where they are hung. One of my favourites is Yngre Glyksborgere which features the 1900 Denmark and the major events happened during that time. 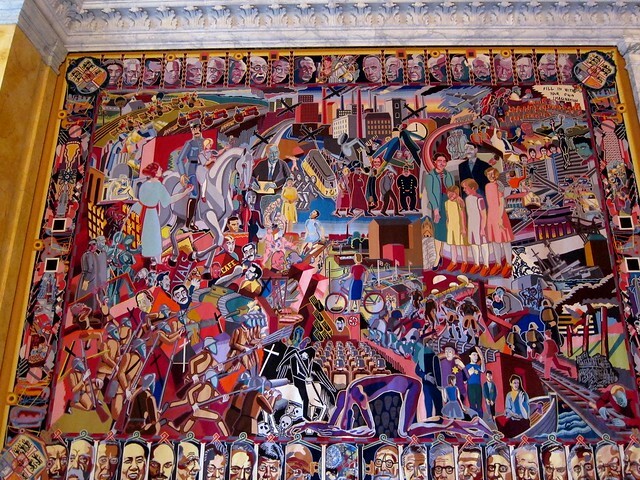 Some of the well-known events and personalities that are featured on the tapestries include the sinking of the Titanic, the release of Donald Duck comic in Denmark, the Beatles, and Hitler and World War II. The border of the tapestries is made up of famous icons of the science and technology, and political fields such as Albert Einstein, Gandhi, John F. Kennedy and so on. I am amazed how Nørgaard managed to squeeze all these in a tapestry and yet make it a piece of interesting and vibrant art piece. Brigitte went over the rope barrier and showed us the back of the tapestries where ropes were sewed onto the borders. In the case of fire, staff will just need to pull the ropes and the tapestries will be released and rolled up and ready to be taken away. 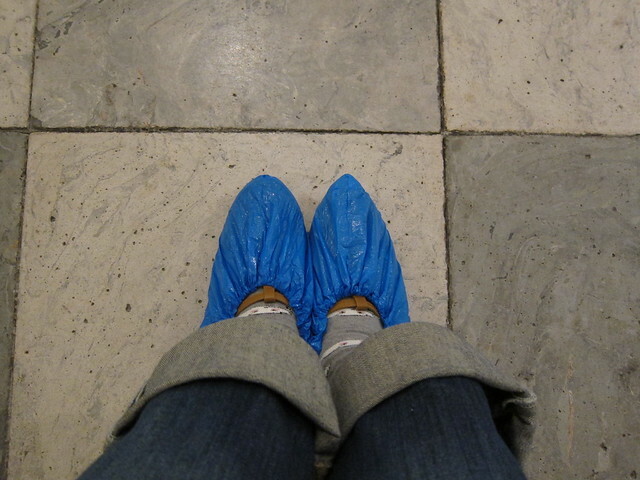 I thought that is a good idea considering the history of Christiansborg Palace. Brigitte continues to share with us the little nuggets of interesting facts about each room, art pieces and the Royal Family. After our 60 minutes of tour, she left us to explore the palace on our own. I quite enjoy the tour as the pace is just right and Brigitte is great, offering titbits of fact, making history interesting. 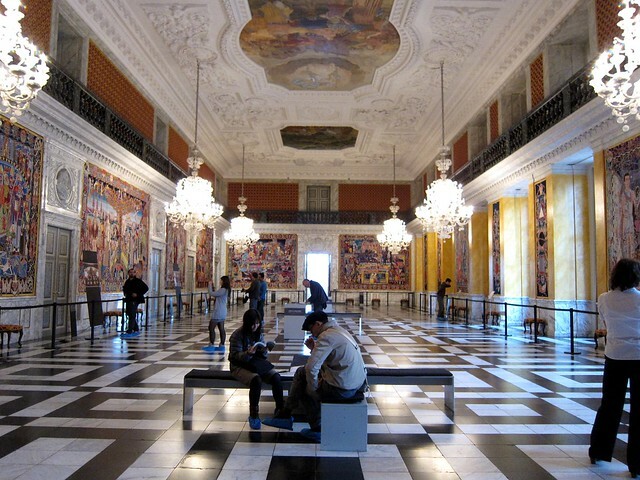 So if you are planning a trip to Copenhagen, try to make it to Christiansborg Palace. The daily tour to the Royal Reception Rooms is free. The Danish tour starts at 11.00 am and the English tour starts at 3.00 pm. Each tour is estimated to be an hour.